” In my classes I focus on floorwork that strengthens the body. In combination with acrobatic elements, I emphasize on a functional approach to dance techniques that allows freedom of movement”. 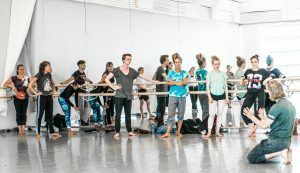 Antero has been teaching at Norges Dansehøyskole (Norwegian collage of dance), Oslo Dance Seminar, Lunds dans & musikal Gymnasium, Rønningen folkehøykole, Schous kulturskole. He has also been teaching masterclasses in Reykjavik Iceland, Stavanger Norway and in festivals like Open Look in St. Petersburg, Amman Contemporary dance festival in Amman Jordan. Antero is currently teaching classes in contemporary floorwork and beginners workshops in parkour. Please contact info(at)anterohein.com for booking and info.